The Community Music School of Webster University is offering free Kindermusik and and Music for Little Mozarts (keyboard) sample classes for children and their parents. Experience a sample class with a variety of musical styles, singing, movement and dance activities, and instrument play. The classes are open to children, ages birth to six-years-old. Reservations for Demo Days are required. Call (314) 968-5939 or register online at webster.edu/kindermusik. Space is limited. Kindermusik is now enrolling for fall classes. If you enroll for classes by Aug. 14, you will receive an Early-Bird discount. Register at a Demo Day with a check and receive a discount. Classes begin September 2. Class descriptions, times and locations, registration information are all available online. Enroll today to secure your spot. 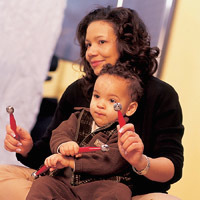 Call (314) 968-5939 or visit www.webster.edu/kindermusik.